The second part of a dramatic reading of the novel The Trojan horse (1937) by American journalist, essayist and author Christopher Morley (1890-1957). In this tragicomic retelling of the Troilus and Cressida legend, published in 1937, the 99.5 Radio Theatre tells a story that transcends time, casually mixing periods to make a Troy as relevant to the 1960s audience as Saigon. Part 2 tells of the Greeks' mysterious offer to exchange the captured Captain Antenor for Cressida; of Cressida's reception in the Greek camp, particularly by the Greek captain, Diomedes; of the Greek's secret weapon, a wooden horse; and of the fall of Troy, with an epilogue in the Elysian Fields. Much of the action of the war is reported over the Voice of Ilium, the Trojan Radio Station. The song, If, in Days of Sullen Air, written by Martin Last and sung by Alison Miller accompanied by Marilyn Scheuer. Technical production by Fred Friedman, assisted by Edgar Walker. Production assistants, Neal Conan and Ellen Jaffe. Script girl, Nancy Willner. Dialogue Director, Joanna Russ. Narrated, produced and directed by Baird Searles for Pacifica Radio and the 99.5 Radio Theatre. 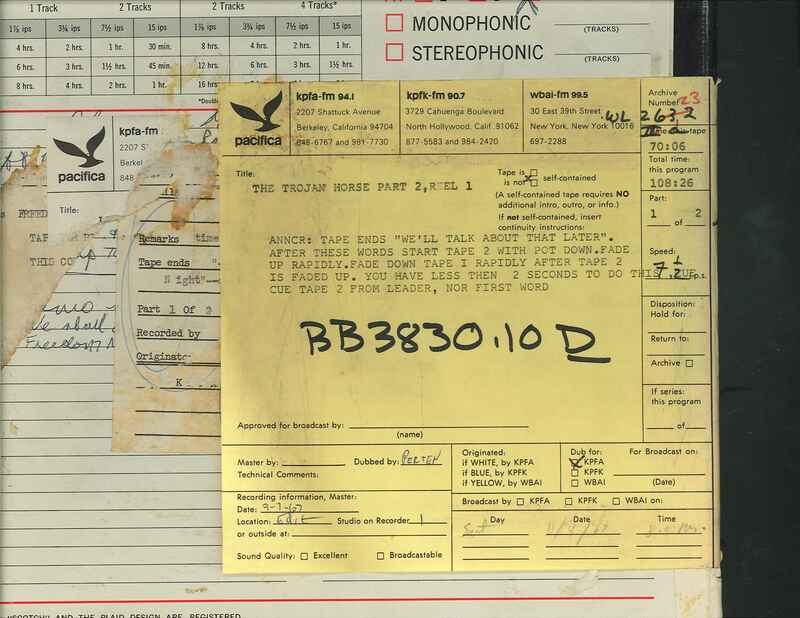 This recording was formerly cataloged as BB3830.10D and as BB3397D. Due to the length of this program, the digitized version had to be recorded onto two CDs.